Consumers have a fourteen-day withdrawal. In addition, we offer you after the statutory deadline extended return options, which do not restrict your statutory rights of return but expand (see box on the right). In order to exercise your right of revocation, you must inform us (Barcelona.de Tourist Info, Löwenstrasse 2a, D-76199 Karlsruhe, Fax +49 (0) 721 609 08 31, E-Mail: contakt@barcelona.de) by means of a clear statement ( e.g a letter sent by post, fax or e-mail) about your decision to withdraw from this contract. You can use the attached model withdrawal form, which is not required. You can electronically complete and submit the model withdrawal form or any other unequivocal statement on this website. If you make use of this option, we will immediately send you a confirmation (e.g. by e-mail) of the receipt of such a revocation. In order to maintain the cancellation period, it is sufficient to send the notification of the exercise of the right of withdrawal before the expiry of the withdrawal period. If you withdraw from this agreement, we have to refund all payments we have received from you, including delivery charges (except for the additional costs arising from choosing a different delivery method than the most favorable standard delivery we offer) immediately and at the latest within fourteen days from the date on which the notification of your revocation of this contract has reached us. For this repayment, we will use the same means of payment as you used in the original transaction, unless expressly agreed otherwise with you; In no case will you be charged for this repayment fees. We may refuse repayment until we have received the goods back or until you have provided proof that you have returned the goods, whichever is the earlier. 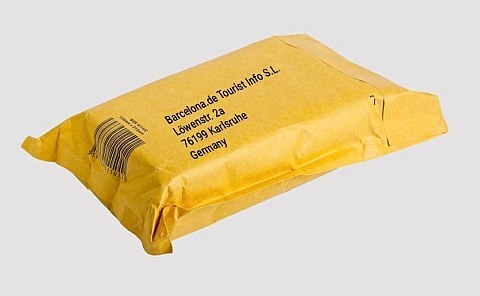 You must return the goods immediately and in any event not later than fourteen days from the date on which you inform us of the cancellation of this contract to us (Barcelona.de Tourist Info, Löwenstr 2a, D-76199 Karlsruhe. The deadline is met if you send the goods before the expiry of the period of fourteen days. You will be responsible for the cost of returning the goods.You only have to pay for a possible loss of value of the goods, if this loss of value to one for checking the condition, properties and functioning of the goods is not due to necessary handling of them. The consumer shall only be liable for any diminished value of the goods resulting from the handling other than what is necessary to ascertain the nature and functioning of the goods. Contracts for the provision of recreational activities when the contract provides a specific date or period (e.g. FC Barcelona home games tickets, tours, city tours, appointment bookings, etc.). In case of cancellation within 14 days (date of return) we will refund the shipping costs paid to us. You can return received products to us by 15th January of the following year. This applies to the Barcelona Cards, Hola BCN! tickets, tickets for the Bus Turístic and Artickets. You can return tickets for the Camp Nou Experience to us six weeks after receipt, but no later than the end of validity. Your statutory rights of return are not restricted by our extended return options but expanded. The goods must be in a resalable condition after expiry of the statutory period of revocation. We will refund the full purchase price. The shipping costs and the return costs will not be refunded. For our services for which the legal right of withdrawal does not apply, we offer customer-friendly cancellation conditions (for example, cancellation until shortly before the event). More detailed information is always available on the respective product page.